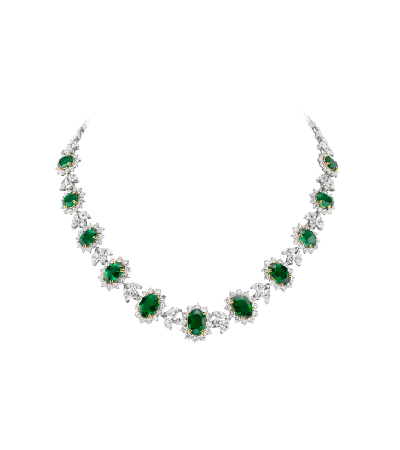 From the historic mines in the Mogok region of Myanmar, the historical mecca for the gem trade and the source of gemstones destined to be worn by royalty, The Empress necklace is befitting a Queen. 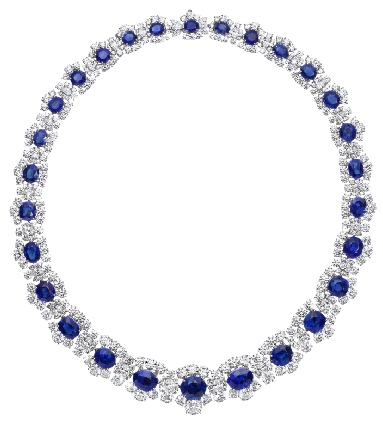 The journey of these magnificent, rare cornflower blue Burmese sapphires speak volumes of a great adventure, and the collection of these fine gems and exceptional diamonds in one masterpiece makes The Empress a once-in-a-lifetime treasure. 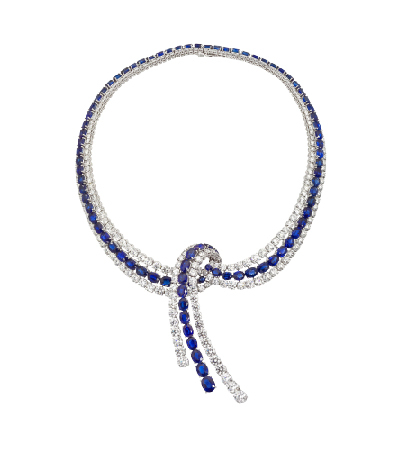 After decades of selective acquisition and nearly a year of meticulous craftsmanship by our award-winning master jewelers, this unforgettable necklace is a highly coveted work of art. 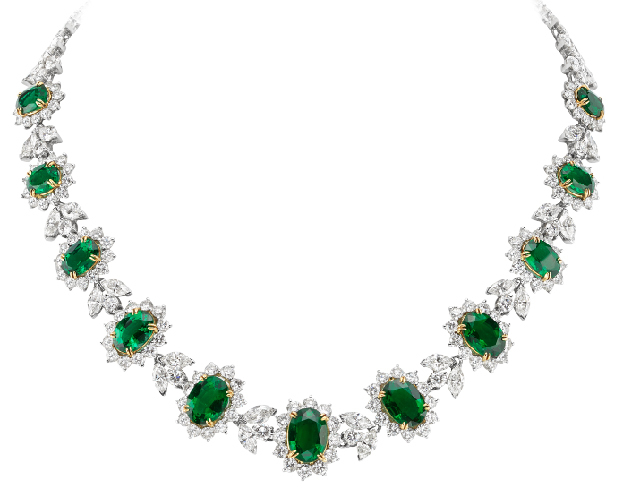 The most magnificent gemstones have been held in the hands of our internationally known and highly regarded Chairman, Alfredo J. Molina, known as one of the top three gemologists in the world. 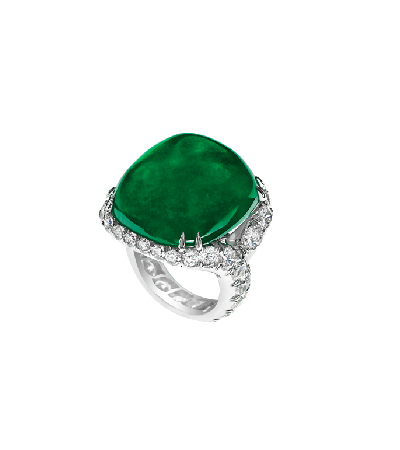 Molina is a global expert on colored gemstones and country of origin, and is regularly retained as an expert for clients seeking the very finest. 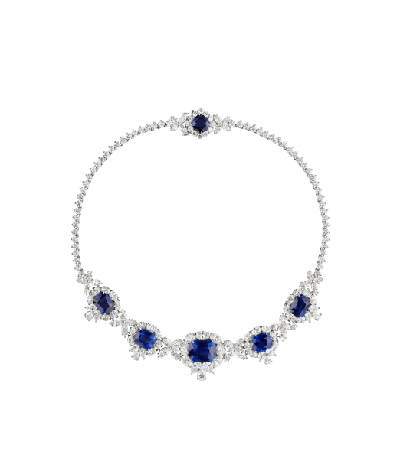 Molina has served celebrities, billionaires, captains of industry and royal houses, and is available to meet with clients by appointment only. 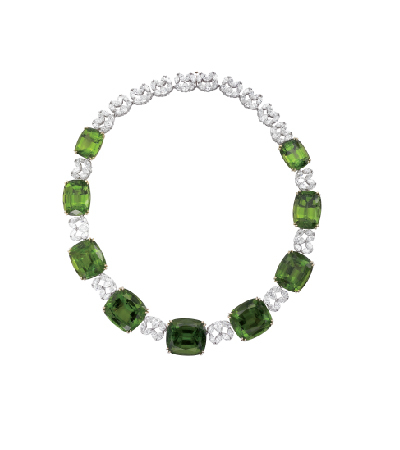 The Chairman's Collection at Black, Starr & Frost represents the very, very best jewelry the world has to offer with magnificent, rare, one-of-a-kind gemstones that only our chairman can deliver. 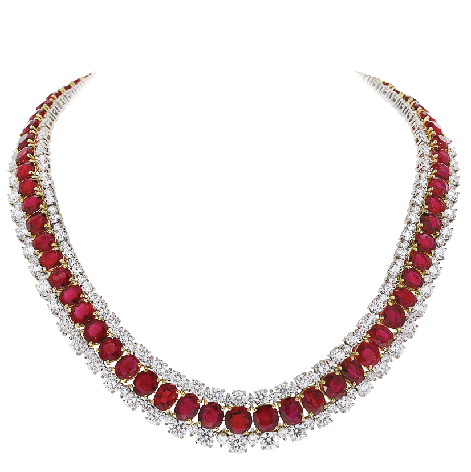 Known as the Cleopatra necklace, this stunner contains 60 oval Burmese rubies weighing 89.24 carats with an addition of 45.15 carats of diamonds. 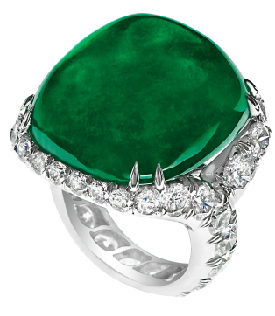 This spectacular, one-of-a-kind, 45-carat Colombian sugarloaf emerald ring is truly a rare find. 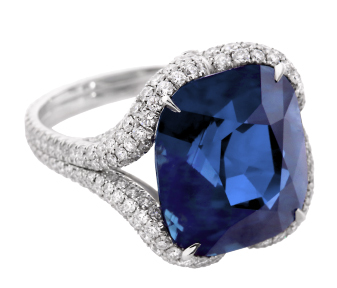 This one-of-a-kind, classically designed sapphire wonder features six rare, cushion-cut, untreated Sri Lankan and Madagascar sapphires weighing 43.06 carats and 152 pear-shape, marquise and round, brilliant-cut collection color diamonds weighing 42.16 carats, all set in platinum. 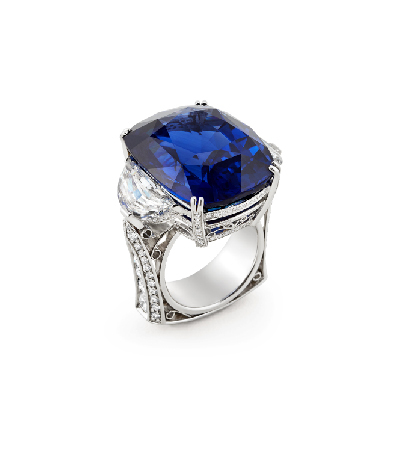 This extraordinary, cornflower blue sapphire and diamond ring features a magnificent cushion-cut Sri Lankan sapphire that weighs 44.88 carats. 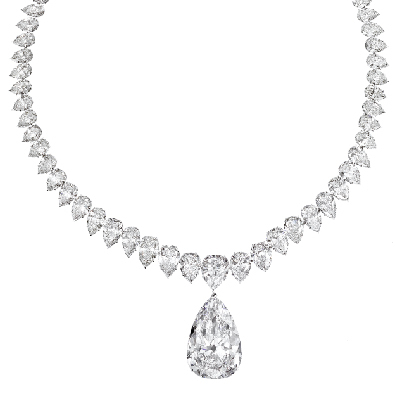 This masterpiece also contains a total of 60 collection-quality diamonds weighing more than 4 carats. 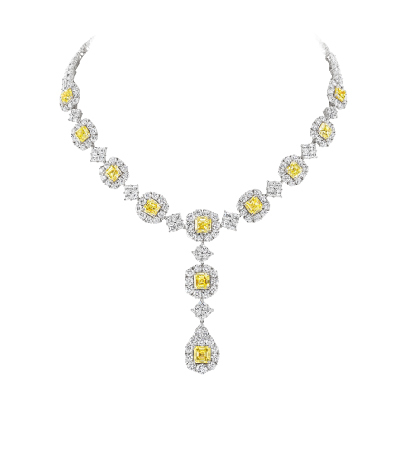 This magnificent fancy intense yellow diamond and white diamond necklace was created by Black, Starr & Frost to showcase rarity. 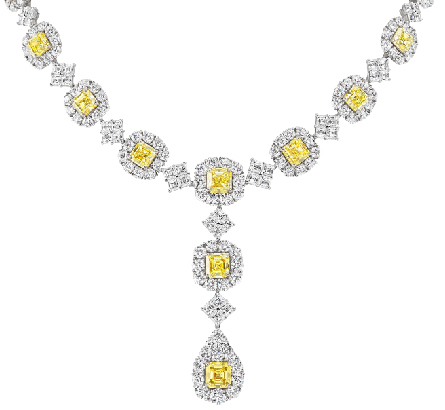 Yellow diamonds of this quality are rarely found in a singular occasion, but to create a necklace containing these imperial Asher cuts is truly a once-in-a-lifetime occurrence. 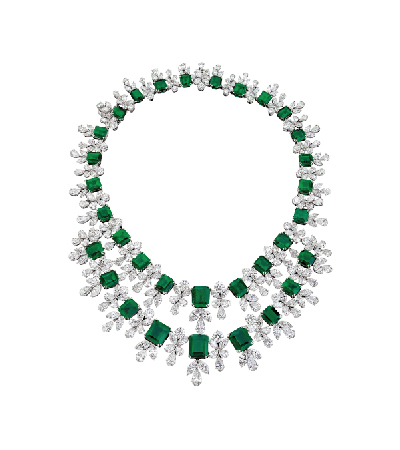 This spectacular, Zambian emerald and diamond necklace set in platinum and 18-karat yellow gold features 216 marquise and round, brilliant-cut diamonds weighing 34.57 carats and 11 oval emeralds weighing 26.46 carats sure to make anyone green with envy. 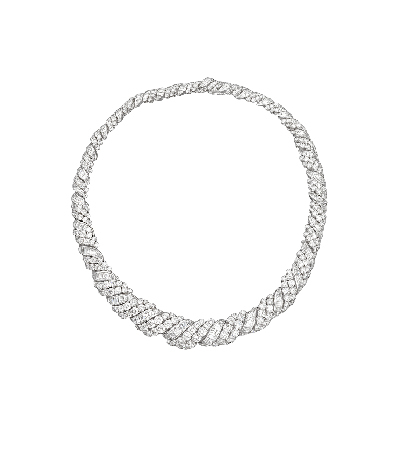 This magnificent platinum and diamond necklace contains 61.43 carats of collection-quality round diamonds and calibre baguettes perfectly matched with a color of D to F and clarity of internally flawless to VVS. 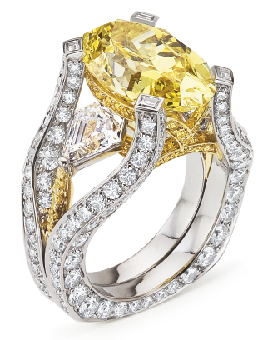 This breathtaking ring is intended for a royal hand with a magnificent oval-cut, canary, fancy vivid yellow diamond weighing 7.02 carats. 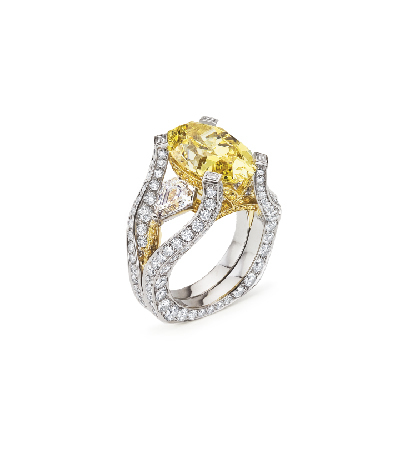 The rare canary gemstone is surrounded by kite-shaped diamonds and vivid, yellow round diamonds in this spectacular setting that is breathtaking in every way. 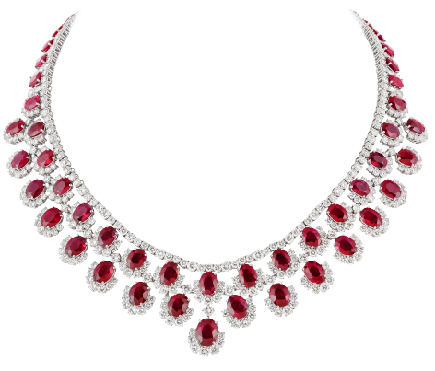 This extremely rare, one-of-a-kind Burmese ruby necklace contains 68 non-heat-treated, pigeon blood red rubies weighing 95.49 carats with magnificent transparency and brilliance, with 272 round brilliant-cut diamonds weighing 34.94 carats ranging from D to F color. 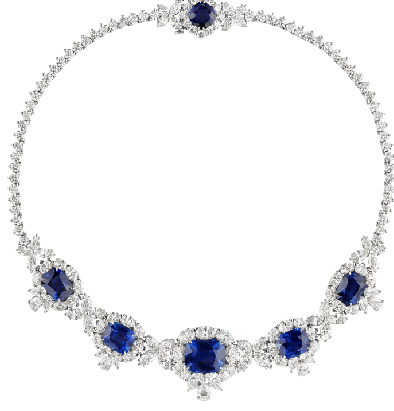 This masterpiece necklace was seven years in the making. 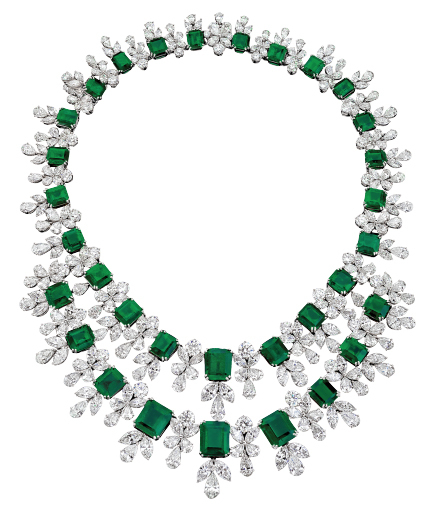 This breathtaking emerald necklace contains the finest Colombian, emerald-cut, perfectly matched emeralds from the Muzo mine. 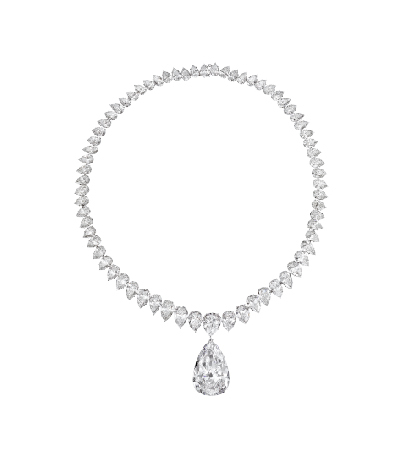 This heirloom is crafted from a collection of D color, internally flawless to VVS1 pear-shaped and round diamonds. 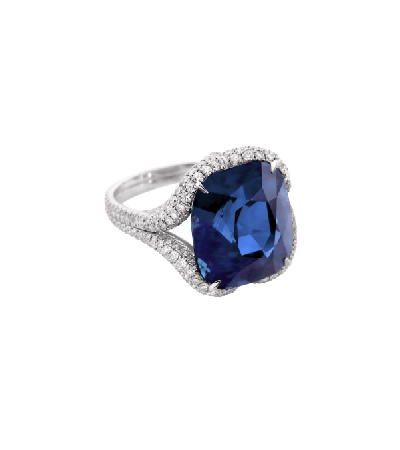 This exquisite sapphire and diamond ring has even our chairman swooning for its magnificent perfectly saturated, textbook royal blue color. 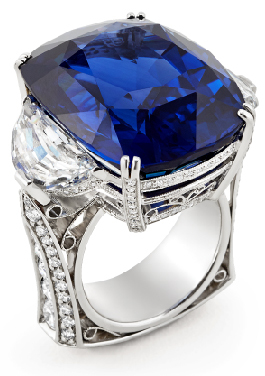 Set in platinum this stunning ring features one cushion-cut, no-heat Ceylon sapphire weighing 14.47 carats and 277 round, brilliant-cut diamonds weighing 1.59 carats. 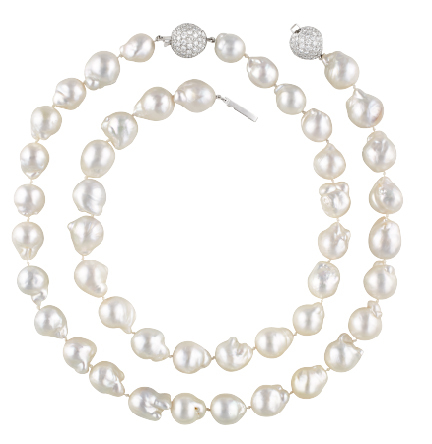 Any woman will feel like Coco wearing this exceptional, baroque pearl necklace featuring 45 large and exquisite pearls ranging from 17.2 to 13.5mm. 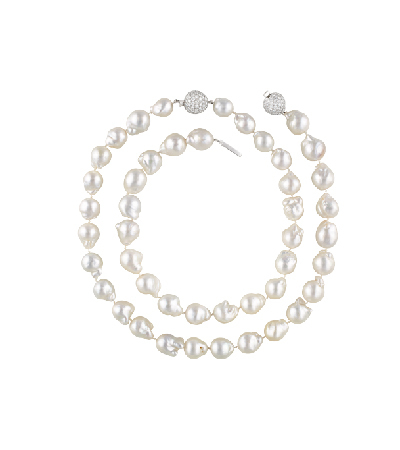 The opera- length necklace is really two stunning strands of magnificent pearls that can be worn as two pearl chokers or one opera-length masterpiece when combined. 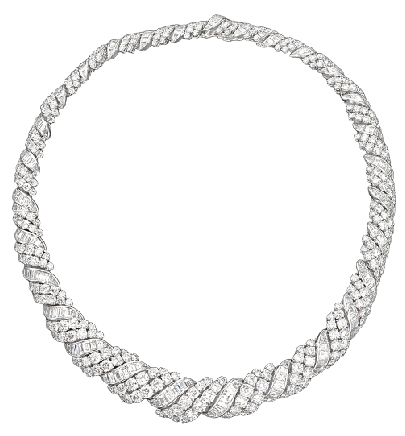 Two diamond baroque clasps add even more brilliance to this piece, containing 102 round brilliant cut diamonds weighing 6.22 carats and the other one containing 93 round brilliant cut diamonds weighing 6.10 carats. 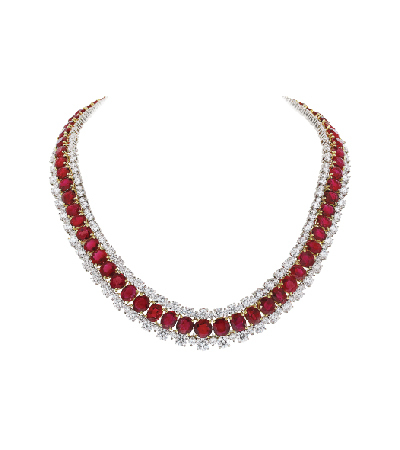 This spectacular necklace contains 170 carats of extremely rare, D color internally flawless diamonds with a magnificent 39-carat D color internally flawless Golconda center diamond. 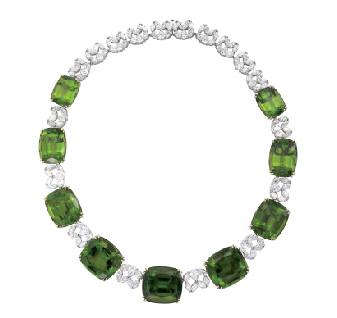 This tantalizing and highly desirable shade of green commands attention in this magical Burmese peridot necklace, creating a lasting impression set among clusters of diamonds. 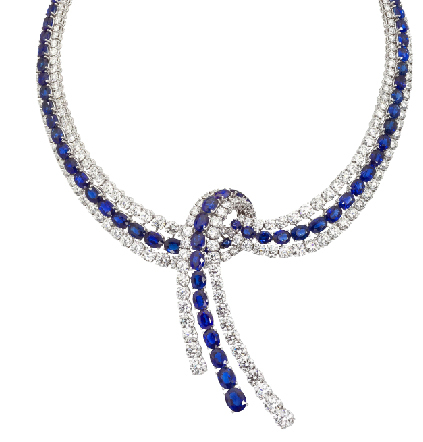 Inspired by a cascading waterfall, this statement necklace features 75.85 carats of gorgeous, oval sapphires and 51.24 carats of round, brilliant diamonds ranging from E to F color all hand set in platinum. 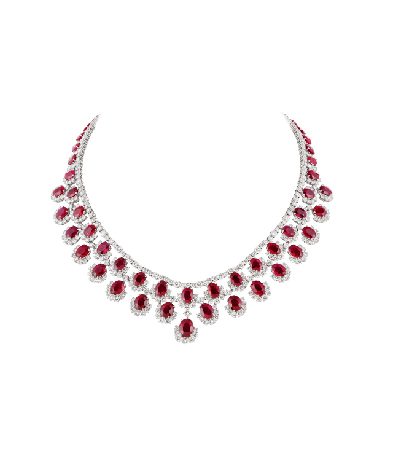 Paired with the waterfall earrings, this suite is red-carpet ready.